Improve your health and wellbeing with the healing power of Vielight. Intranasal phototherapy is the simple way to maintain your natural internal balance. Low-level light rays irradiate the bloodstream and promote homeostasis2 , helping you regulate everything from metabolism to blood pressure, and more. Originally developed in Russia as an intravenous cannula, phototherapy was refined by the Chinese, who realised that the dense network of capillaries around the sinus glands would allow for quick and effective transportation around the bloodstream. It soon hit the market as a non-intrusive, commercially available clip to be placed in the nostril, and has since sold over 10 million units. The reason for its popularity is simple; it works quickly and effectively on a whole variety of illnesses and imbalances. By promoting the right chemical activity in the bloodstream at a cellular level, intranasal phototherapy works across numerous mechanisms of action to achieve its profound therapeutic effects. 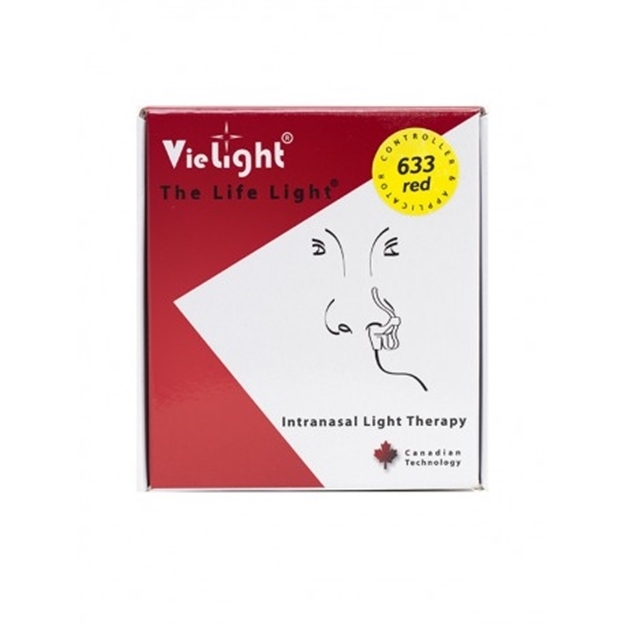 The most popular use for Vielight in Russia is for rhinitis and sinus allergies3 . China, however, has explored the many different ways phototherapy can improve health, and put the VieLight to work on many conditions. Blood pressure and cardiovascular disease4 are two main benefactors â€” largely because these are conditions that begin in the bloodstream. By normalizing cell aggregation (that is, preventing red blood cells from sticking together), Vielight keeps a healthy flow around the body. Vielight also helps maintain healthy lipid levels â€” it’s been shown to increase high-density lipoprotein (‘good cholesterol’) by over 12%, while reducing low-density lipoprotein (‘bad cholesterol’) by over 9%. It’s also proved effective against neural conditions such as insomnia, Alzheimer’s Disease, and Parkinson’s Disease5 . Nitric oxide (NO) levels can also be improved by the light’s activation through the blood vessels behind the nose (that picture used in said article speaks 1000 words). Improved NO levels have been implicated to have many health benefits including dilating arteries and blood vessels and hence improving arterial condition and blood flow. Users have observed an improvement in other conditions such as schizophrenia, migraines, trigeminal neuralgia, diabetic neuropathy, and low immune system. The simple reason for this vast array of healing properties is down to Vielight’s ability to support the right chemical changes6 at a cellular level, which spread easily and quickly around the body via the bloodstream. Over time, free radicals accumulate in the body, causing tissue and organ damage. This oxidization process is the key element in the physical and biological effects of aging. By harnessing reactive oxygen species (ROS), Vielight acts as a potent antioxidant â€” removing free radicals from the body. It also boosts NAD+/NADH, a family of enzymes that play a crucial part in life span regulation and homeostasis. Want to stay healthy, in control, and full of vitality? The solution’s simple; let the light into your life. 1. MedicLights Research Inc. Biostimulation Mechanism with Intranasal Light Therapy -What really happens under the surface. http://www.mediclights.com/biostimulation-mechanism-with-intranasal-light-therapy/ Accessed April 24, 2014. 2. Liu TC, Liu R, Zhu L, Yuan J, Hu M, Liu S. Homeostatic photobiomodulation. Frontiers of Optoelectronics in China. 2009;2(1):1-8. http://link.springer.com/article/10.1007/s12200-009-0010-3. Accessed April 25, 2014. 3. Neuman I, Finkelstein Y. Narrow-band red light phototherapy in perennial allergic rhinitis and nasal polyposis. Ann Allergy Asthma Immunol. 1997 Apr;78(4):399-406. http://www.ncbi.nlm.nih.gov/pubmed/9109708. Accessed April 25, 2014. 4. MedicLights Research Inc. Lowering high blood pressure naturally through intranasal light therapy. http://www.mediclights.com/wp-content/uploads/2011/09/Lowering-blood-pressure-naturally-05-101.pdf. Accessed April 25, 2014. 5. Smith K. The Photobiological Basis of Low Level Laser Therapy. Laser Therapy. 1991; 3: 19-24. http://www.stanford.edu/~kendric/PDF/B53.pdf. Accessed April 25, 2014. 6. MedicLights Research Inc. Effect of low level laser therapy on hypertension. http://www.mediclights.com/effect-of-low-level-laser-therapy-on-hypertension/#_ednref4. Accessed April 25, 2014. Q. How do you compare the LED vs Laser for the Vielight intranasal light therapy device? A. There are some papers that suggest that low level lasers are more effective than LEDs – several websites publish these to support their products. However, these studies are based on transcutaneous/transdermal (applied to the skin) applications, not on intravenous or intranasal blood irradiation. There are anecdotal reports claiming the superiority of the laser version for certain conditions; the two in particular are sleep disorder and chronic anxiety. For a better appreciation, one has to revert to actions at cellular and molecular levels. The actions of the enzyme in the electron transport chain in the mitochondria, cytochrome c oxidase is now commonly accepted as the photo-acceptor that catalyses cellular level activity when red to near-infrared red light hit the cells. The mechanisms involved in intranasal light therapy involves a somewhat different process, but the point is, whether there is a difference in the outcomes between LED and laser. Basically, the cells and the body systems respond to the combination of the wavelength of the light and the energy dosage. The coherent light in lasers can have more concentrated energy than the normal non-coherent light in LEDs, even though most commercially available semi-conductor low level laser diodes have a built-in divergence of about 57 degrees. But at low level intensity, does it matter? When using LED instead of laser diodes, the Vielight 633 compensates for the lost coherency by increasing the energy output- so that we can compensate for the difference in efficiency. In the end, we will see the same dosage at the cellular level. In the case of intranasal light therapy applications, because we are in the realm of well under 10 mW in energy output and dealing with much thinner dermal layers, the increase is so small that the user does not feel anything. The membrane inside the nasal cavity is thin enough that a LED diode with some recalibration will achieve the same result as the laser diode. The bottom line is that the Vielight 633 has the same effective outcomes as a laser device, the only difference is that the LED device is a bigger drain on the battery because of the additional energy requirements. 1. Hamblin, M.R., Demidova, T.N. (2006). Mechanisms of Low Level Laser Therapy. Proc. Of SPIE 6140 (614001), 1805-7422/06. 2. Smith, K.C. (2005), Laser (and LED) Therapy Is Phototherapy. Photomedicine and Laser Surgery, 23, 78-80. 3. Karu, T. (1989). Photobiology of low-power laser effects. Health Physics, 56, 691-704. 4. Whelan, H.T. et al (2001). Effect of NASA Light-Emitting Diode Irradiation on Wound Healing. Journal of Clinical Laser Medicine & Surgery. 19 (6). Each treatment session lasts 25 minutes. One session per day is recommended. it can be used at any time but bedtime may be the most convenient. The unit will automatically swtich off at the end of each session. 1)Open the back cover by pressing the release button, hold it down and simultaneously slide open the back cover. Insert a 1.5V AA battery. 3) Set the applicator lens deep inside notse, with the clip on the outside. 5)The unit will remain switched on for 25 minutes. indicator lights will blink throughout the session. The number of blinking indicator lights will reduce over time, which is indicative of the remaining time. 6)At the end of the session, the unit will beep three times and then switches off. The unit may be switched off at mid-session by pressing the button. 2)To access the battery compartment, open the back cover by pressing the release button, hold it down, and simultanteously slide open the back cover. Insert a 1.5V AA battery. 1) to clean the applicator, gently wipe the surface with a cotton swab or a soft cloth moistened with hydrogen peroxide. You can wipte the applicator regularly with clean water. 2)Use a soft, dry cloth or cotton swab to clean other surfaces. Do not use abrasive cleaners. Do not submerge the Applicator or Control Unit in water. 3)Store the equipment in a dry location, free from dust, away from direct sunlight. the storage temperature should be within 10C and 40C. 4)Clips are made of tough, hig-impact plastic materials. However, excessive bending can cause permanent deformation or breakage.